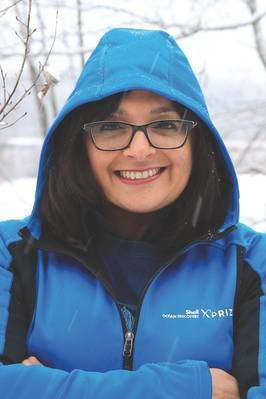 Marine Technology Reporter catches up with Dr. Jyotika Virmani, Ph.D, Senior Director, Shell Ocean Discovery XPRIZE and members of the GEBCO-NF Alumni Team as the conclusion to the $7 Million Shell Ocean Discovery XPRIZE fast approaches. The Shell Ocean Discovery XPRIZE is a global competition challenging teams to advance deep-sea technologies for autonomous, fast and high-resolution ocean exploration. The prize will stimulate even greater exploration and mapping of the ocean floor, helping to uncover our planet’s greatest wonders and resources for the benefit of humanity. The winner will be announced next year, but Round 2, ‘Competition Testing’ takes place in November and December of this year. It’s the last chance for the nine teams still in contention to prove their design and engineering has what it takes. It’s crunch time. Round 2 is designed to stretch the underlying concepts, innovations and technologies that the teams have integrated and distilled to develop new solutions that will help map even more of the seabed. For the testing, all nine new technologies must launch from shore or air and with restricted human intervention. Once operational, each team will have a limited number of hours to explore the competition area (at depths of up to 4,000 meters) to produce a high resolution bathymetric map, images of a specified object and identify archaeological, biological or geological features. MTR took a brief look at the nine finalists following their announcement at Oceanology International 2018 in our April issue and have since had a chance to catch-up with Dr. Jyotika Virmani, Ph.D, Senior Director, Shell Ocean Discovery XPRIZE and some of the minds behind one of the entries, the USV Maxlimer. Built by the GEBCO-NF Alumni Team, USV Maxlimer is based on a brand new USV called SEA-KIT, which can carry a deployable and retrievable payload of up to 2.5 tons – in this case, a Hugin AUV from Kongsberg Maritime. It’s a unique AUV-USV concept, designed to enable more efficient, safer and cost-effective seafloor mapping operations, as well as providing a platform for numerous applications in a wide range of maritime sectors. The SEA-KIT vessel itself provides a next generation, long-range, long-endurance ocean capability that is not available today. It is able to operate without assistance for months at a time and is the first of a new generation of craft that can truly operate independently. Built by British company Hushcraft, Sea-Kit, combined with the deep and rich expertise of the GEBCO-NF Alumni Team, the Hugin AUV and autonomy, positioning and communication technology from Kongsberg Maritime certainly has the potential to provide a new, more efficient way to map the oceans. Of course the other eight teams all have innovative new concepts to prove, making it impossible to predict the winner of the Shell Ocean Discovery XPRIZE. But we will find out soon. What do you hope to achieve through the Shell Ocean Discovery XPRIZE? The Shell Ocean Discovery XPRIZE aims to achieve three key goals: to accelerate technology in marine underwater robotics, especially mapping, imaging, and the autonomous detection of chemical or biological signals; to catalyze new markets by removing manned vessels and make it cheaper to access the deep sea; and finally, to inspire the public – these robots are discovering a new underwater planet with strange lifeforms and unfamiliar terrains. These exponential technologies can be used to assist in deep-sea environmental management, conservation, and even ecotourism. Ultimately, we envision this technology will be used to map the entire seafloor at a high resolution by 2030 – in alignment with the goals of Seabed 2030. How does this particular prize fit within the overall aims of the XPRIZE foundations? The Shell Ocean Discovery XPRIZE is part of our Ocean Initiative, which aims to put us on an unstoppable path to a healthy, valued, and understood ocean. Without understanding something, people are less inclined to value it, and without valuing something, we don’t care about making it healthy. A map provides a fundamental piece of understanding the environment that surrounds us, but we only have a good map of 10-15% of our own sea floor at the moment. Without understanding what is out there, we won’t truly be able to value this planet that we call home. What do you see as the main challenges or obstacles to ocean exploration and how might the prize help the industry to overcome them? The ocean covers 71% of our planet and the area to be explored is vast and difficult to access. The competition sets up the audacious goal of producing a high-resolution map of at least 250 km2 of a 500km2 competition area in 24-hours, which requires fast and autonomous solutions that will take us a long way towards quickly mapping the deep ocean floor at a high resolution and discovering what is in the oceans. A key element of the competition is unmanned operations. Can you explain why this was chosen as a focus? In developing this prize, one of the market failures that was identified was the expense of mapping the sea floor because of the need for manned ships at sea. By focusing on autonomous operations, we incentivize the development of a range of new vehicles and approaches that can be deployed from the shore and map an area without any humans at sea. The finalists were announced in March; what were the key criteria used to select the teams that would proceed? The team solutions were assessed on their performance against 11 criteria: autonomy, collision avoidance, data retrieval, depth capability, endurance, imagery, mapping resolution, navigation, seaworthiness, size and weight, and speed. These were chosen as a Technology Readiness Test and provided the judges with information on how a team would perform in a real-world scenario. While the teams are primarily focused on winning the prize, do you expect to see much commercialization of the technology developed for the competition afterwards? A number of the technologies, not just the winners, are expected to be commercialized. A range of technologies will be required in order to achieve the ultimate goal of mapping the entire seafloor by 2030, and once we have a map of this planet, there are others with ocean environments to be mapped. The competition incentivizes teams to develop breakthrough technologies for ocean exploration; are there any innovations that you have seen so far that you can highlight? In addition to autonomous operations at sea with shore-based deployments, the technology that teams are using to conduct the sub-surface work range from an aerial drone to deploying underwater pods, to swarms of underwater vehicles operating in tandem to cover the competition area, to a number of different approaches that require an autonomous surface vehicle that carries the subsurface component of the technology to the offshore competition area. We are also seeing a variety of approaches to rapidly mapping a large area, with teams using the traditional boustrophedon manner and two teams who are mapping circular areas as their underwater pods move vertically through the water column. One team is also mapping using laser instead of acoustic techniques. With regards to the GEBCO-NF Alumni team’s USV Maxlimer, can you tell us what impresses you most about the concept and technology? This is a surface vehicle that can be controlled autonomously from shore and will carry the sub-surface component of the entry to the offshore competition area for deployment and recovery at sea. This is a wonderfully robust and versatile technology that will be able to handle a range of sea-states. Although we have only seen it operate with one AUV, the ultimate goal is that it can be adapted to deploy and recover a number of different styles of sub-surface technologies. Can you tell us about the final testing – what will the teams’ solutions have to do and how will you decide the winner? The final round of the competition will challenge the teams’ solutions to autonomously map the deep-sea floor (down to 4,000m depth) at a horizontal resolution of 5m or higher and a vertical resolution of 0.5m or higher and bring back 10 images from the ocean all within 24-hours. 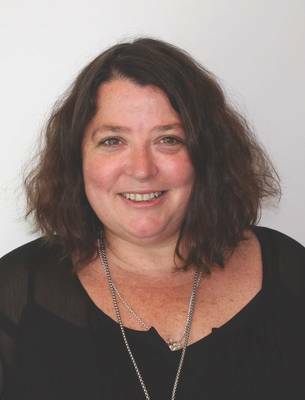 Our independent expert judging panel will assess the maps against a gold-standard baseline maps to see how well the solutions performed. They will, along with the help of the public, judge the images that the solutions bring back to us. We understand that movie director James Cameron was involved in the early stages of the prize’s development; is he still on board and actively working with you, or following developments? Mr. Cameron has been a long-time advocate for ocean exploration, and, of course, mounted his own expedition to the Mariana Trench in 2012. He is also on the Board of Trustees for XPRIZE and was one of the people who brought the initial genesis of this idea to the attention of XPRIZE at one of our annual Visioneering events. From there, XPRIZE continued the full development and design of this competition. Are there any other ocean-based XPRIZE’s in the pipeline for the future? As part of the XPRIZE Ocean Initiative, we are beginning some initial investigative work on a potential Saving Coral Reefs XPRIZE, as well as a Natural Disaster Prediction XPRIZE. Corals are a major ocean ecosystem and due to a variety of stressors, they have seen a severe decline over the last few years. Can we stop or reverse this decline? Natural Disasters such as earthquakes (and stemming from that, tsunamis) or tropical cyclones result in the loss of tens of thousands of lives (extreme events can result in losses of hundreds of thousands of lives) and billions of dollars in economic loss annually. Can we prevent such losses? And then there were nine… Out of 32 starters, nine teams are now in contention to win the $7 Million Shell Ocean Discovery XPRIZE. Why was GEBCO training program established? The Nippon Foundation / GEBCO training program was established in 2004 to address a number of points: It is the first program of its kind focused on Ocean Bathymetry and the skills required to do this effectively. It is a capacity-building initiative recruiting candidates from primarily developing nations. 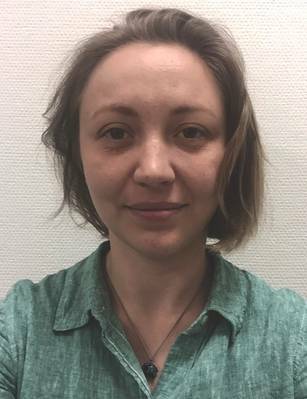 The program produces a new network of dedicated early-career scientists and ocean mappers to feed into global ocean initiatives and infuse younger members into GEBCO with an international diversity. What are the key elements of your role as project lead for the GEBCO-NF Alumni team’s entry to the Shell Ocean Discovery XPRIZE? This is complicated technology and a complex project. Bringing together all the stakeholders, financial partners, technology providers and GEBCO Alumni volunteers was my primary challenge. There are several working groups and over 50 international individuals who work on this project. We all worked together cohesively towards a single goal for a successful Round 1 demonstration. My most important role was ensuring that communication lines between all groups working on the project were kept open. Can you explain how and why you arrived at the unique ASV / AUV approach you have developed with the USV Maxlimer? The Team recognized early on that most of the technology required to meet the Shell Ocean Discovery XPRIZE challenge existed commercially, but lacked a comprehensive, innovative workflow to work together. We wanted to utilize existing proven means in exciting new ways and leverage emerging technology, such as cloud- based data processing and unmanned surface vessels. Alumni of the GEBCO training program come from all over the world; do you feel the international nature of the group has helped in terms of developing innovations for USV Maxlimer? The boat designer was very good at listening to the expertise and knowledge of the team members and how this fulfilled requirements for the competition. This translated into the design and development of an innovative new surface vessel as our collective expertise guided Hushcraft’s vessel designer and allowed him to combine his background with this new information to produce USV Maxlimer. The team is not only international, but from diverse backgrounds, and it is this diversity which is the team’s strength. Did the team come up with any other concepts for your Shell Ocean Discovery XPRIZE entry that might have made the cut? Our focus from the beginning has been unchanged: “The team will leverage state-of-the-art surveying technology with new innovations in offshore logistics backed by industry leading companies to collect higher resolution bathymetric data through autonomous means.” We planned therefore to combine emerging technology with established hardware and data automation. Do you feel that autonomous operations are really the only way to efficiently map the world’s oceans and what are the key benefits? I think autonomous operation are only part of the solution to efficiently mapping the world’s ocean. This is an enormous task ahead of us and it will require a variety of different approaches. Each innovation, however, plays an important role as we focus on understanding our oceans better. The key benefits to using a USV and AUV is that they are cheaper and safer ways to produce higher-resolution data. 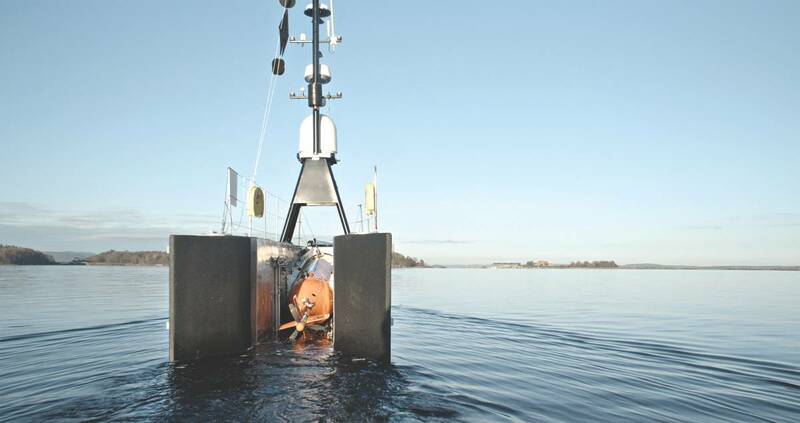 You tested USV Maxlimer in Norway with Kongsberg Maritime last September. What were you aiming to achieve at this stage and did everything go according to plan? Our sea trials over the summer prepared us well for the Shell Ocean Discovery XPRIZE Technology Readiness Tests and allowed us to successfully complete all 11 of the criteria defined by XPRIZE. We successfully operated an uncrewed (unmanned) dual USV/AUV operation with 11 km2 of data collected and then published in a GIS online environment. We found out that the GEBCO-NF Alumni team was one of nine Shell Ocean Discovery XPRIZE finalists in March. Why has USV Maxlimer done so well in the competition? I think the USV Maxlimer is only one part of our success. Each component of our solution is as important as any other and all had some innovation built in – and it is this cohesive approach to producing information from the bathymetric data collected that allowed our team to be as successful as we have been so far. Each piece is an important part of the puzzle – with the final products, whether images of the sea-floor or bathymetric charts showing the morphology and character of the seafloor, being the main objective of the team’s entry. USV Maxlimer has been successful as she offers the means to deploy, retrieve and manage AUV operations flexibly, in either remote or autonomous modes. Outside of your own entry, are there any other teams that you feel have developed something special? One of the goals of XPRIZE is to stimulate and innovate technology. From what I’ve seen in other team’s solutions, that goal has been achieved. Ocean Mapping has a long way to go and is open to exciting new innovations – and any work that brings this into focus is both important and essential. As you move towards the final stages of the competition, are there any areas of the design or operation of USV Maxlimer that you are working on or looking to improve? Hushcraft, the designer and builder of the SEA-KIT USV Maxlimer continues to design and develop the vessel to be the best possible and most versatile surface vessel available as a solution to a multitude of maritime tasks. And finally, do you feel the concepts, innovations and technologies developed for USV Maxlimer could have wider implications and applications other than ocean mapping? We are confident that there are a wide range of applications that USV Maxlimer will be useful for. Why is entering the Shell Ocean Discovery XPRIZE important for the GEBCO-NF? As part of General Bathymetric Chart of the Oceans community our bigger goal is to provide the most comprehensive publicly available bathymetry of the world’s oceans and new technology is an essential component of major GEBCO-NF project Seabed 2030. Shell Ocean Discovery XPRIZE is getting us closer to this goal. What is your role within GEBCO-NF? I was coordinating the Data group during Round 1 overseeing the logistics of the group and the development of the data workflow. Can you describe some of the data processes you are using to enable GEBCO-NF to reach its aims of mapping the world’s oceans? We are using existing software such as CARIS HIPS & SIPS and ESRI ArcGIS. The main goal of the Data team is to make our workflow as autonomous as possible and to reduce processing time. When we put an aim such as mapping the world’s ocean the first thing is to develop equipment, however, then we are facing another big challenge – how to efficiently process a huge amount of data and reduce possible human errors. Our team concentrated its effort on efficiency of data processing. Are you seeing enthusiasm for GEBCO-NF’s work from government and industry in terms of collaboration and data sharing, with i.e. national hydrographic agencies or commercial entities? We see incredible enthusiasm especially in industry. Autonomous data acquisition and processing is now one of the most competitive and pressing problems in the field. Our industry partners include mapping equipment developers, software developers, and service providers and this collaboration is useful for every side. What are the key challenges you are facing in such a huge task? The key challenge for data processing team is time. Big data sets should be processed and all information should be visualized in such a manner that it is easy-to-understand for general public and finally, in the context of the XPRIZE, it should be delivered online to judges within 48 hours. Can you tell us what the product(s) that GEBCO-NF is working towards will be, how they will be accessed and by who? The main product is a map of the given seafloor area that XPRIZE will assign to us and at least 10 images of any geological, biological or archeological objects. These products should be uploaded to online platform ArcGIS online where our account can be accessed by XPRIZE judges. We feel that as members of wider GEBCO community this is also our opportunity to demonstrate what kind of derivative information can be obtained using bathymetry data. And how will your product ultimately help maritime users? Development in automated data processing and development of information products will ultimately benefit maritime users. We are working towards faster and more efficient ways of delivering products to end users and general public. 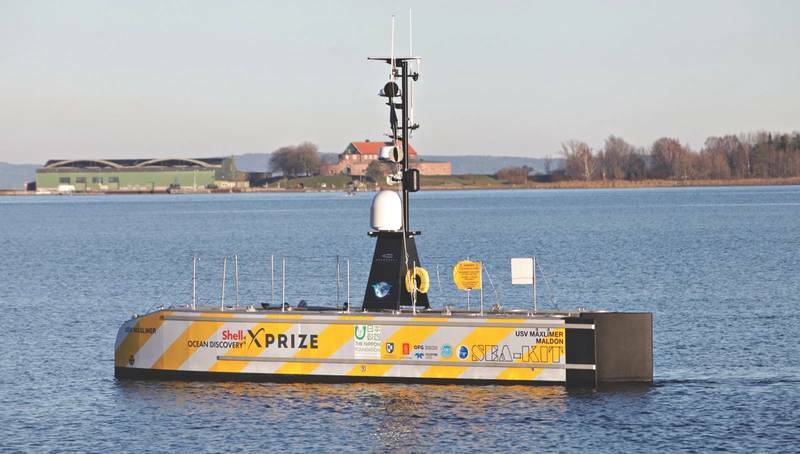 Maritime autonomous technologies are evolving rapidly. Our team concept is unique as it utilizes a new class of surface vessel that can transport, deploy and retrieve underwater data collection vehicles. This represents a tremendous leap forward in autonomous technology because it provides high resolution deep ocean mapping capability with a vehicle that can be launched from the shore. This does not currently exist in the market. How does your role as Data Group Lead come into play in the context of USV Maxlimer and the XPRIZE? The data group is in many ways the most important component of our solution as it is the data group that produces the information that is then accessible to the general public – that highlights the data collected and fosters excitement about the seafloor. The whole entry will be judged by its end result – the products that we will deliver. USV Maxlimer’s essential role is to deliver the AUV to the mapping site and provide accurate positioning and mission control. How could USV Maxlimer augment your existing processes if it went into full operation? Now USV Maxlimer’s role is primarily to deliver and retrieve the Hugin AUV (the primary data collector) and act as a communication hub during all operations. However, this vessel is designed for long-range, long-endurance autonomous operations offshore. For ocean mappers that means that with sufficient remote or autonomous onboard data processing capabilities and Cloud technology we can have instant access to information about the seafloor. We are considering operationalizing USV Maxlimer after the Shell Ocean Discovery XPRIZE competition. It will be capable for nearshore, coastal and offshore missions. As the GEBCO-NF Alumni Team is fully supporting the goals of Seabed 2030, we hope to educate others and demonstrate autonomous mapping technologies. Finally, do you feel that autonomy is the only way forward for improving efficiency in ocean mapping? I wouldn’t say that it is the only way, but this is definitely one of the most efficient ways to map vast areas of our oceans. Seabed 2030 is a collaborative project between the Nippon Foundation and GEBCO. It aims to bring together all available bathymetric data to produce the definitive map of the world oceafloor by 2030 and make it available to all. Seabed 2030 builds on more than 100 years of GEBCO’s history in global seafloor mapping. GEBCO was established as the sole international body responsible for the publication of ocean floor maps. In existence since 1899, the 7th International Geographic Congress held in Berlin nominated a Commission on sub-oceanic nomenclature that was also to be responsible for the publication of a general bathymetric chart. The Commission convened in Wiesbaden (April 15-16, 1903), with Prince Albert I of Monaco in the chair, and adopted the characteristics defined in a memorandum by J. Thoulet. The 24 sheets of Carte générale bathymétrique des océans were then printed in Paris in 1905. Although not widely known, GEBCO has been responsible for all subsequent version of the paper charts and the current range of products, which includes global gridded bathymetric data sets; a global set of digital bathymetric contours; the GEBCO Gazetteer of Undersea Feature Names; the GEBCO Digital Atlas; the GEBCO world map and the IHO-IOC GEBCO Cook Book. With two levels of autonomy, below and above the surface, how challenging is it to ensure controlled, safe navigation of both vessels during mapping operations? The system architecture of autonomy for planning, analysis and execution is similar for AUVs and USVs but there are differences in sensors and functions because of the environment. Lack of GPS and radio communication are fundamental constraints to AUVs that are solved by acoustics and aided inertial navigation systems. USVs need advanced scene analysis and route planning to navigate safely in areas with maritime activity. There are significant thresholds to sufficient functionality and robustness of the individual systems. The most critical phases of the combined USV-AUV operation are launch and recovery. We will increasingly see swarms of USVs and AUV, which will make operations more complex. Can you explain some of the core technology that allows both vehicles to operate fully autonomously? How does it work? The core of the system, in both cases, is a set of modules that sense the environment and the vehicle, analyzes this information and executes according to a mission plan, utilizing a set of vehicle controllers such as heading and speed controllers, trajectory control and payload controllers. The brain of the system can sort this information according to when and where different states should occur, and in the future think of new ways to solve a specific challenge. You’ve seen USV Maxlimer and the Hugin AUV in action during sea trials and Technology Readiness Tests; do you think it is ready to win the Shell Ocean Discovery XPRIZE? I do think the GEBCO-NF alumni team has a very sound strategy. They build on commercially proven solutions such has the HUGIN AUV, HiPAP position and communication system and the HISAS mapping system, partner with SEA-KIT for a truly ocean going USV and focus on integration and data processing. The combined SEA-KIT/HUGIN system has a maturity level ready for XPRIZE. It will be exciting to compare with the other participants and learn the outcome of the competition. Have you and your team come up with any alternative applications that the dual above and underwater autonomy approach could benefit, aside from seabed mapping? The HUGIN AUV has had automatic pipeline tracking since 2012, so pipeline inspection is an obvious application to pursue. Because of the cost benefits, I think USV-AUV concepts will rapidly be applied to applications within survey, inspection, science and naval. Kongsberg has been developing AUVs for subsea surveying since the early nineties; how has this experience informed your move in the last few years to developing Marine Autonomous Surface Vessels? 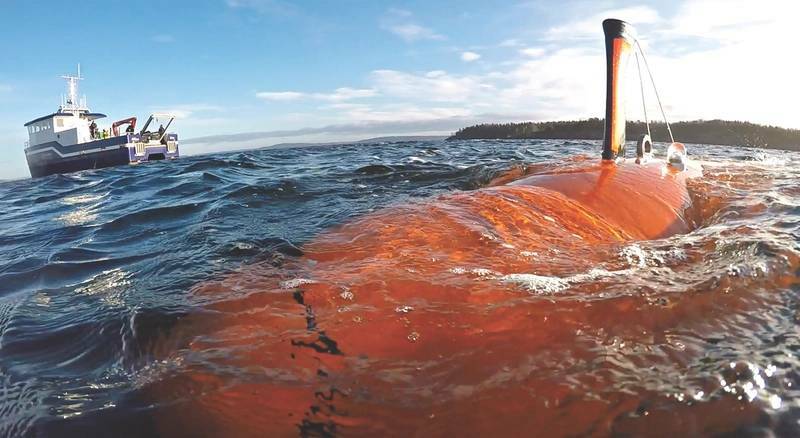 The Marine Autonomous Surface Vessels (MASS) program in Kongsberg builds on technology and experience from both our advanced vessels systems and AUVs. Autonomy is a key enabling capability. However, a MASS comes with same advanced solutions as seen for larger vessels, for navigation, maneuvering, propulsion, automation and power as well as communication, remote operation and cloud functions. MASS is a major initiative. Kongsberg builds on mature products, invests in development and runs stepwise test and qualification programs. Can you tell us about any recent developments in your AUV or USV portfolio for the subsea market? In partnership with Eelume, Equinor and NTNU we bring forward new radical technology for subsea inspection, maintenance and repair. The underwater vehicle is called Eelume and is a self-propelled robotic arm that can transit over long distances and carry out IMR in confined spaces. 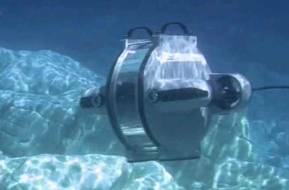 Eelume is very hydrodynamic and capable of complex IMR. The vehicle is designed to be subsea resident, which we believe will disrupt IMR costs. Docking technology and wireless battery charging are common technology functions for subsea docking stations, USVs, AUVs and Eelume. We are working on connectivity and cloud solutions to support remote operation, autonomy and ease handling of data. 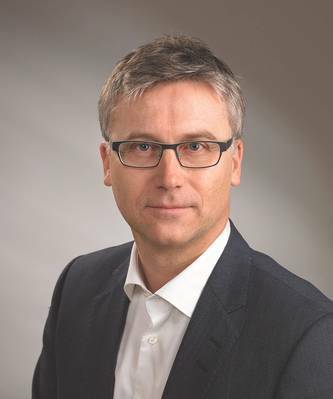 KONGSBERG has launched Mapping Cloud, which is an open ecosystem to store, analyze and share data. The first version of Mapping Cloud supports the Kongsberg EM multibeam echo sounder range. We work with partners for the data processing solutions. We are extending the Mapping Cloud to offer easy handling of all data recorded in AUV and USV operations, as well as the full range of KONGSBERG sensor systems. Will your work with the GEBCO-NF Alumni team inform future autonomous vehicle commercial developments? I think AUV-USV systems will see increasing commercial use because of clear cost benefits. There will be significant developments in autonomy and advanced sensor processing. But I believe the GEBCO-NF Alumni team has demonstrated that the technology is available and it is a matter of the ocean mapping community to bring the pieces together in systems that do the job reliably. With final stages of the Shell Ocean Discovery XPRIZE competition closing in, is your work still ongoing? Have you had to overcome any obstacles recently to ensure that everything is ready? Yes, there are many challenges to overcome. The team led by the GEBCO-NF alumni work very hard with SEA-KIT, KONGSBERG and all partners to get ready for Round 2. The Nippon Foundation GEBCO Seabed 2030 project has changed our view and ambitions for the ocean and seabed mapping. XPRIZE is a true challenge and will have significant impact. It is exciting to be part of the vision and solution for a sustainable ocean. In addition to USV Maxlimer and Hugin AUV, what innovations have been achieved in your hydroacoustic surveying technology recently that could help deliver on Nippon Foundation and GEBCO’s Seabed 2030 project? The purpose is to map the seabed. The HUGIN AUV is equipped with the latest HISAS 1032 synthetic aperture sonar and also comes with an EM 2040 multibeam echo sounder acting as a gap filler. This combination provides a continuous wide swath of high accuracy, high resolution bathymetry, and in addition, the HISAS synthetic aperture sonars provide imagery at very high resolution. The HISAS systems go deeper and wider, and we see very high area coverage rates coming. As a rule of thumb, doubling of area coverage rate enables seabed data at half the cost. Sensors with high area coverage rate, unmanned robotic platforms and cloud solutions for efficient storing, handling and sharing of data are an excellent combination for detailed mapping of the seabed. Kongsberg’s autonomy controller technology is capable of being integrated with almost any vessel via an electrical interface. It provides adaptive waypoint following for survey and AUV operations while accepting sensor data for scene analysis and collision avoidance. It is an autonomous system designed to follow mission plans, in addition to providing global supervised operations or even direct operator control for complex tasks. The solution is the common autonomous control engine to be used by unmanned and autonomous vessels delivered by Kongsberg Maritime including the fully electric container feeder, YARA Birkeland. 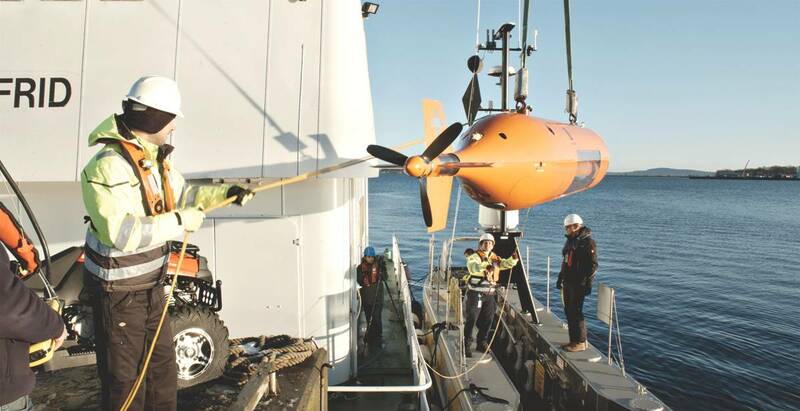 It has been developed by the Kongsberg Maritime in conjunction with FFI, the Norwegian Defence Research Establishment and builds on a history of collaborative development projects, including the HUGIN AUV System. In addition to the the autonomy controller solution, SEA-KIT will be equipped with Kongsberg Maritime’s Maritime Broadband Radio (MBR) for high bandwidth direct communication to shore, SeaPath 135 with an MRU5+ for heading, attitude and positioning and the AIS300 Automatic Positioning System. KONGSBERG’s HiPAP acoustic positioning and control system will be used to supervise AUV operations.